A zesty lemon square on a shortbread type crust with reduced amounts of butter and sugar to reduce the calories. Heat oven to 350 °F (175 °C). Spray 8" x 8" baking pan with cooking spray. Mix 1 cup of the flour, 1/4 cup of sugar, and salt in bowl until well combined. Cut the butter into flour mixture until a crumbly dough forms. Press dough evenly into bottom of prepared baking pan. Bake until lightly golden (about 10-12 minutes). Cool crust completely. Whisk egg, egg white, and remaining 1/2 cup of sugar in bowl until combined. Grate zest and squeeze juice from lemon and add to egg mixture. Add baking powder and remaining 3 tablespoons of flour. Mix thoroughly. Pour liquid mixture over cooled crust. Bake until set and lightly browned on edges. This will take approximately 20 to 25 minutes. Cool completely and dust top with powdered sugar and cut into 16 squares. 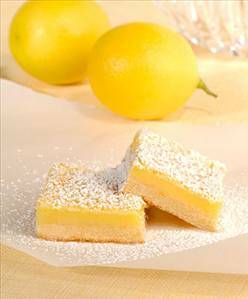 There are 123 calories in 1 serving of Zesty Lemon Bars. Calorie split: 18% fat, 74% carbs, 8% protein. Delicious, easy to make version of the old favorite cookie. Easy to make very yummy dessert. Oatmeal and banana baked like cookies. Grahm cracker topped with fat free strawberry cream cheese fresh blueberries and drizzle of honey.